Enjoy our traditional morning tea as we make our way to the impressive Wellington Dam. It is a very impressive sight and quite often overflows. We call into the Wellington Forest Retreat for a delightful lunch and optional wine tasting. Lovely location set amongst the forest with lot’s of wildlife. 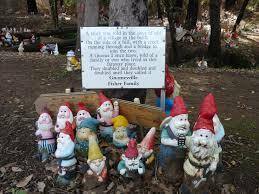 Our journey continues into the Ferguson Valley to visit the impressive Gnomesville, maybe bring your own Gnome to add the thousands already dotted throughout the bush setting. Stop for an ice cream break on the way home.